Internet gives you endless information and easily connects you with people across the globe. It is a place where you find and get access to information about everything without any restrictions. But due to increase in number of cyber-attacks, piracy, illegal activities and cyber security concerns, you might find your surfing experience a little constricted. Certain websites are ‘blocked’ for us in certain regions. This is especially true when it comes to accessing torrent sites. Pirate Bay is a very good example of such restrictions. Different countries impose different restrictions like blocking access to torrent sites or social media sites. There is surely a solution, to every problem and so we have one for this problem too. The answer to this question is VPN – Virtual Private Network. VPN helps users create a private network and hides your identity when you access the internet. You can send and receive information in such a way, that no one is able to identify who you are or where you’re located. It creates a tunnel between your computer and all other public and shared networks, to allow access to all blocked content. Hope, you have now understood what VPN is all about. Now, let’s move on to check ways to use it. Must Read: Will VPNs Protect You from ISPs’ Surveillance? There were times when getting a VPN was not affordable, but it is not the case any longer. You can get it even for free now. Also, there is no need to setup a complicated software or even fiddle with your router. 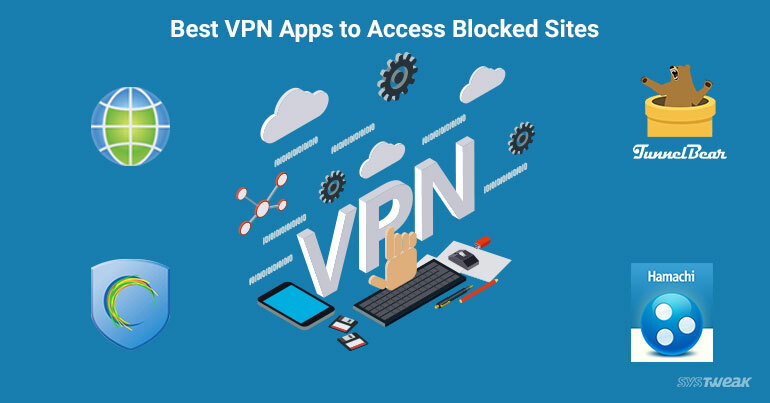 Most of the services now offer extensions, one-click VPN enabler, and even browsers now come with inbuilt VPN options, and Windows PCs have the option to configure them right in the core. Before we start with the discussion I would like to inform that free tools are good at bypassing local blocks. But, you should skip accessing your private data through them. Must Read: Is a logless VPN secure after all? This is one of the most popular and easy to setup, VPN. There is no need to sign-up to use it also it’s easy to toggle on and off. But there is a drawback, it is browser-based. It is available as a browser extension, for mostly all the common browsers. You just need to install it, and choose the location you wish for. After setting the location, try to visit any blocked website from anywhere by typing the URL. There are five free locations, Netherlands, Singapore, UK and US, which help you access possibly 99.9% of the websites around the world. If you want to use it on your smartphone, you can only use it on iOS, they are still working on the Android version. No VPN is better than a browser in built VPN. Opera lets users use free VPN without restrictions, this feature was rolled few months back only. The VPN is hosted right on the Opera servers this makes it easiest of all to use. You can choose between the available locations which include US, Canada, Singapore, Netherlands, and Germany. It also shows you the amount of data transferred each day, and IP address. To activate VPN on Opera, go to the browser settings >Privacy & security> Enable VPN. Once you enable it, you’ll be able to see a button in the browser address field, from here you can adjust VPN preferences, turn the feature off and on, as well as see stats on data used. You can even use the VPN in private mode. As already explained why a paid VPN is preferred over Free, let’s have a look at some of the most popular ones. Privacy from ISPs, hackers, and anyone who monitors the network. Vigilant Mode: If the connection gets disturbed, TunnelBear will block all unsecured traffic until it’s safely reconnected. It is fast, and comes with one click turn on option. Multiple Device support i.e. upto 5 devices. It offers software based solutions also, it has extensions, for Chrome and Opera. If you are looking for a VPN which offers various features then Hamachi by LogMeIn is the perfect one. As it is not browser based, you can connect you pc and can take along more PCs. Hamachi lets you create a virtual network, and connect more PCs (optional), and then use it as any standard VPN. It is a useful when you have multiple PC and you want to access sites over VPN. Last but not the least is Hotspot Shield. It not only makes you access blocked sites, it also alerts if you try to access any infectious site. It offers anonymous surfing, security over WIFI, and hides your IP address.